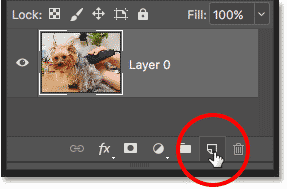 In this tutorial, I show you how to use clipping masks in Photoshop to show and hide different parts of a layer and fit images into shapes! We'll learn the basics of how to create a clipping mask, and we'll explore the idea behind them in more detail so that by the end of this lesson, you'll have a solid grasp on how clipping masks work. I'll be using Photoshop CC but everything is fully compatible with Photoshop CS6 and earlier. Let's get started! 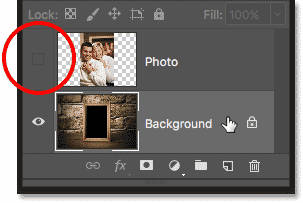 Clipping masks in Photoshop are a powerful way to control the visibility of a layer. In that sense, clipping masks are similar to layer masks. But while the end result may look the same, clipping masks and layer masks are very different. 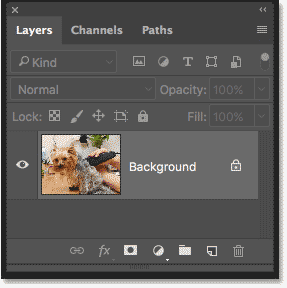 A layer mask uses black and white to show and hide different parts of the layer. 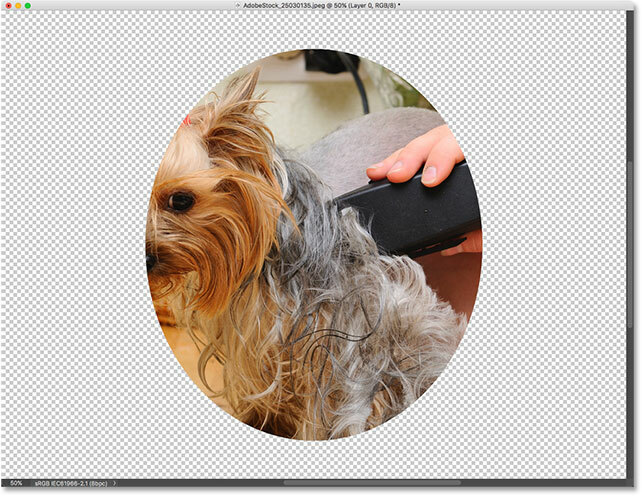 But a clipping mask uses the content and transparency of one layer to control the visibility of another. 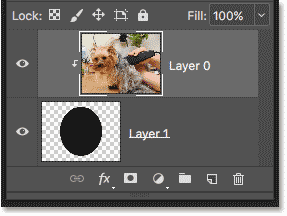 To create a clipping mask, we need two layers. 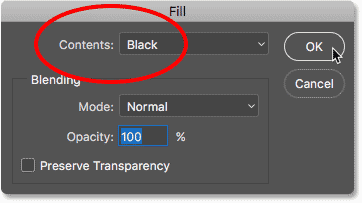 The layer on the bottom controls the visibility of the layer above it. In other words, the bottom layer is the mask, and the layer above it is the layer that's clipped to the mask. Where the bottom layer contains actual content (pixels, shapes, or type), the content on the layer above it is visible. But if any part of the layer on the bottom is transparent, then that same area on the layer above it will be hidden. That may sound more confusing than how a layer mask works, but clipping masks are just as easy to use. Let's create a clipping mask ourselves so we can better understand how they work. 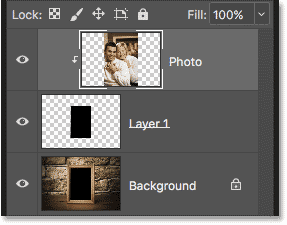 Unlocking the Background layer lets us add a new layer below it. 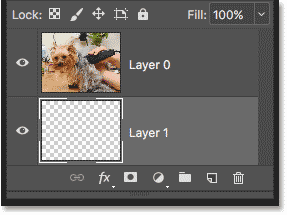 Adding a new layer below the image. The second layer needed for the clipping mask has been added. 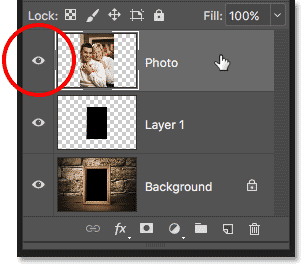 Clicking the visibility icon to hide the photo. The checkerboard pattern means the bottom layer is transparent. Clicking the same visibility icon. The top layer contains actual content. 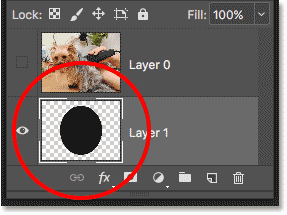 Clipping masks use the content and transparency of the layer below to control the visibility of the layer above. Let's create a clipping mask using our two layers and see what happens. Step 2: Choose "Create Clipping Mask"
The Layers panel showing the top layer clipped to the bottom layer. 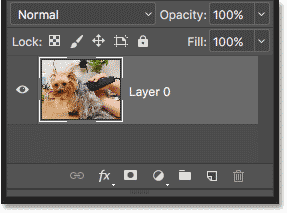 With no content on the mask layer, the image on the clipped layer is hidden. 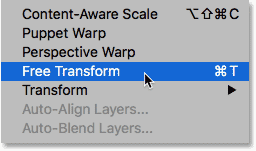 Going to Layer > Release Clipping Mask. The layer mask has been released. With the clipping mask released, the image returns. 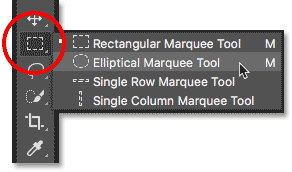 Drawing a selection with the Elliptical Marquee Tool. The bottom layer now contains both content and transparency. The preview thumbnail showing the content and transparency on the bottom layer. Selecting and turning on the layer that will be clipped. Go again to Layer > Create Clipping Mask. 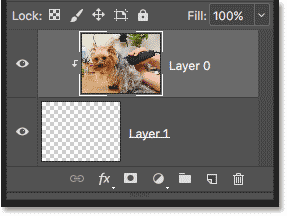 The Layers panel again showing the clipping mask. The content on the bottom layer keeps part of the top layer visible. 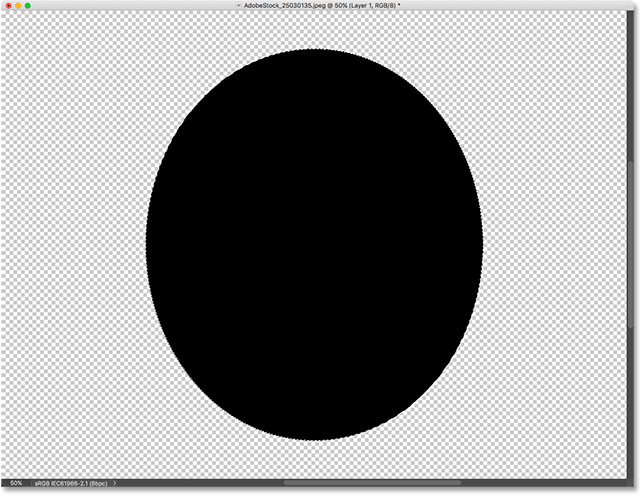 The clipping mask after centering the photo within the shape. 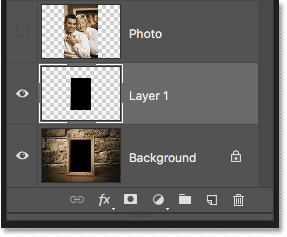 While layer masks are best for blending layers with seamless transitions, clipping masks in Photoshop are perfect when your image needs to fit within a clearly-defined shape. The shape may be one you've drawn with a selection tool as we've seen. 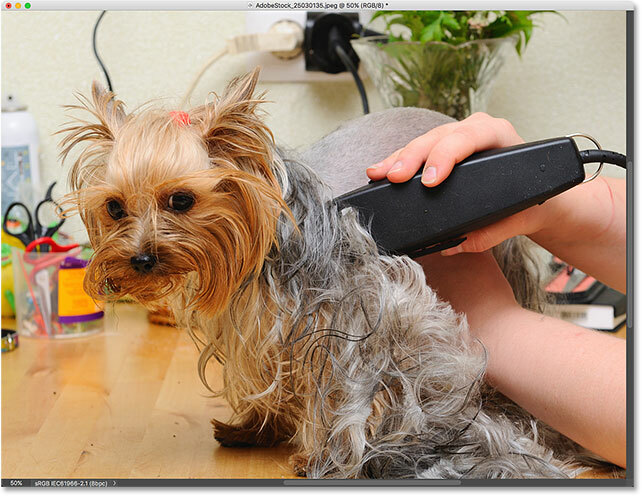 But a clipping mask can also be used to fill a vector shape with an image, or to place an image inside text. 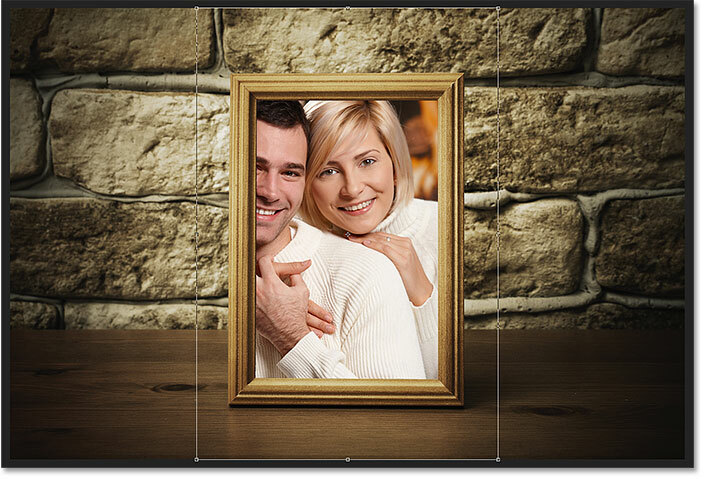 As another example of what we can do with clipping masks, let's quickly look at how a clipping mask can be used to place a photo inside a frame. Hiding the top layer and selecting the bottom layer. Selecting the Magic Wand Tool from the Toolbar. Selecting the area that will be used for the clipping mask. The area inside the frame appears on its own layer. Selecting and turning on the top layer. The clipping mask icon appears. 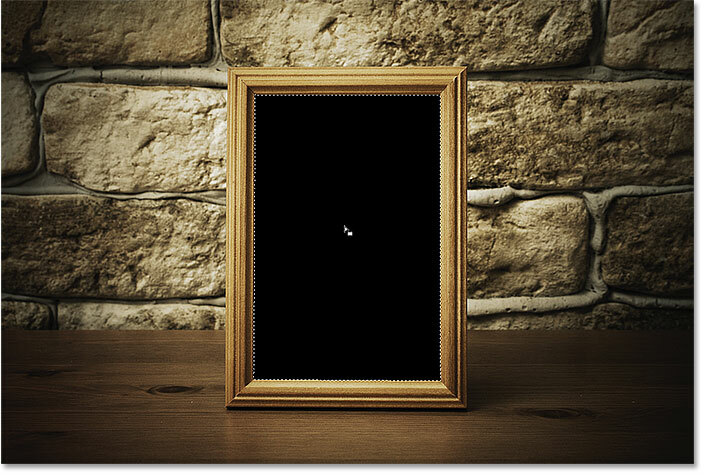 The image is now clipped to "Layer 1" below it. 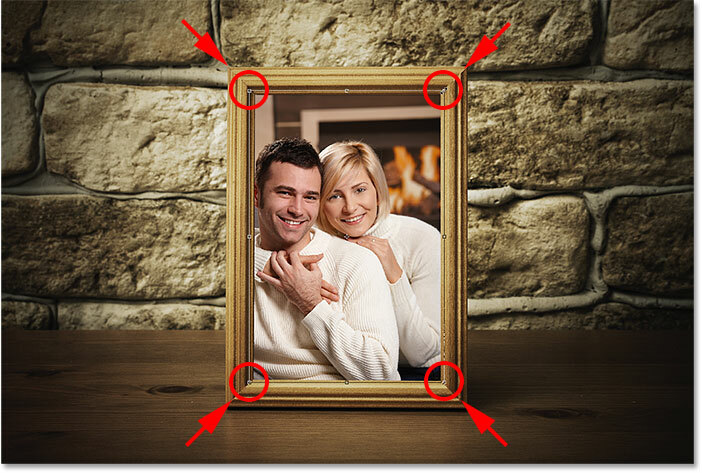 The photo is now clipped inside the frame thanks to the clipping mask. 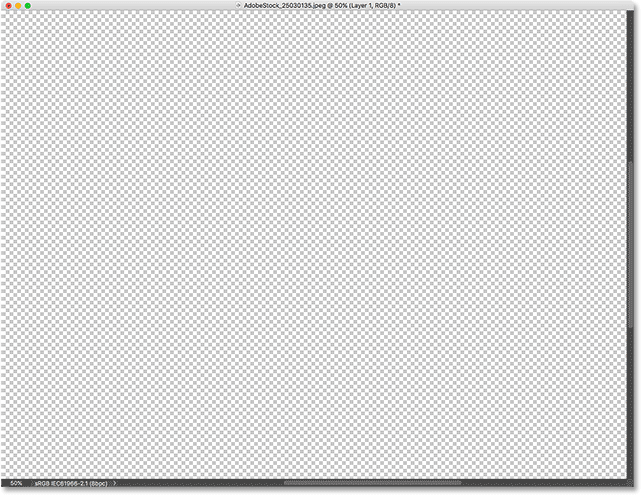 The Free Transform handles appear around the entire image, including the hidden areas. 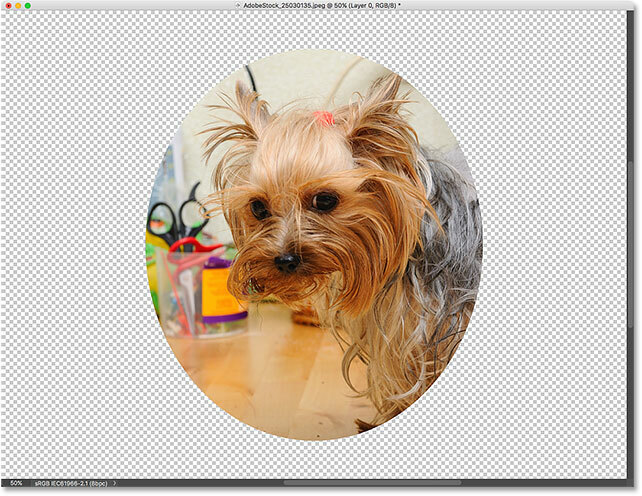 Resizing the photo inside the clipping mask. The final clipping mask result. And there we have it! That's how clipping masks work in Photoshop and how to use a clipping mask to show and hide different parts of a layer! 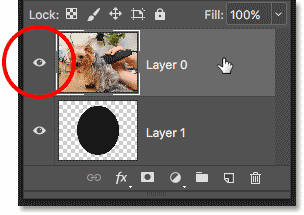 Visit our Photoshop Basics section for more Photoshop tutorials!